The Spring Equinox starts in just a few hours and depending on where you live, the daffodils might be starting to show off their pretty yellow heads. It’s been a pretty nasty winter around the country, so for many, the flowers and other signs of spring are a welcome sight! In addition to adding a bit of color to our lives, the Vernal Equinox also marks the start of spring cleaning activities around the world. From homes to offices, people eagerly purge their homes of dirt and clutter that’s no longer of use (we’re looking at you, floppy discs!). Where did the ritual of spring cleaning start? There’s no clear answer on this. Some say it dates back to the Jewish practice of thoroughly cleaning the home in advance of Passover. Others say that it traces back to the Persian New Year, or Nowruz (pronounced “no-rooz”), where Iranians clean everything from drapes to furniture before kicking off a 13-day celebration of dinners, family visits and reflections for the year ahead (sign us up!). For cleaning professionals, spring cleaning offers an opportunity to reset. We talked a little while ago about how the (OS1) System can help a professional cleaning operation “tidy up,” and Ben will be presenting next week at the Clean Buildings Expo on “How and Why Remediating Your Cleaning Program Works”, but even just a few simple steps can help you spring clean your department to make it safer and more productive. One of these steps is focusing on custodial closets. Aside from the challenges everyone talks about — labor, pressure to do more with less, etc. 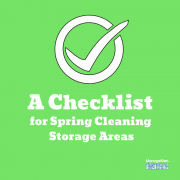 — storage for all the “stuff” associated with cleaning is a big issue for many people responsible for managing custodial operations. 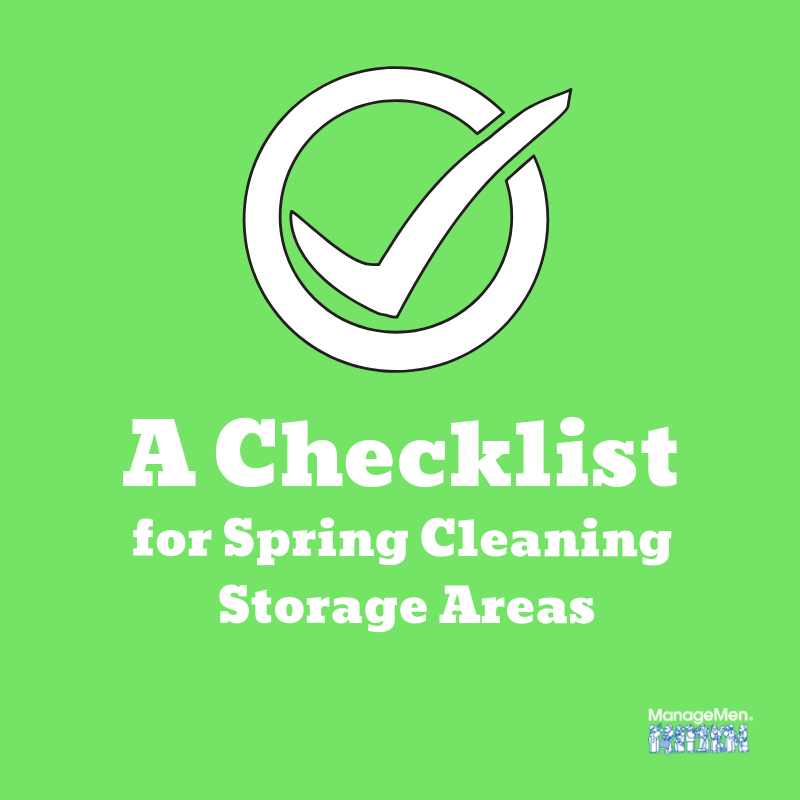 Cleaning workers should have storage areas on every floor, and possibly more depending on the footprint of the building. Safe chemical handling starts with safe chemical storage. 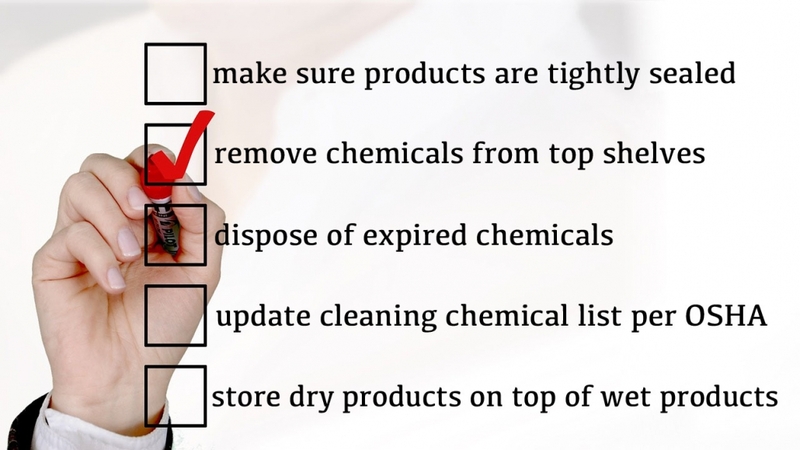 Here are a few things you can do to “spring clean” your chemical storage areas. But as we continue exploring dangers associated with poor chemical handling processes, where we store cleaning chemicals should be an important area of focus. This includes cleaning out these areas. Secured storage is critical, in order to limit access to building occupants and others who lack the knowledge and training to properly to handle chemicals. Held in one central bulk storage area, the chemicals should be kept clean, neat and sorted by hazard classification (e.g. don’t store flammable chemicals with oxidizers). Make sure all of your Safety Data Sheets are up-to-date and organized—which you can easily do with our SDS “Beyond Compliance” Wall Mounted Station! Happy Spring, and Spring cleaning!